The cast of the Jungle Theater’s reunited cast of The Wolves, now playing at the Southern Theater. A city wrapped in ice, haunted by a pack of wolves. Not normal wolves on the edge of human society, preying on the occasional sheep and staying in the shadows – these wolves defy the normal “accepted” nature of things and have returned to the city. I’m writing, of course, not about the infamous Wolves of Paris who terrorized that city in the bitterly cold winter of 1450. I’m talking about the play The Wolves by Sarah DeLappe, which played at the Jungle Theater last year and returns in a full-fledged revival that reunites the original cast. Just like the Wolves of Paris, this cast has done something that no other pack has done before, bringing the Jungle to its first ever simultaneous stagings: The Children at its normal home in Uptown Minneapolis, and The Wolves at the Southern Theater in the Cedar-Riverside area of Minneapolis. The Southern has long been one of the best dance stages in the region because of its expansive stage and the steep rake of the seating, which gives the audience a great appreciation and view of the depth and breadth on which movement and choreography can unfold. The Jungle’s excellent production in its home venue was admittedly a little cramped; the Southern’s stage turns out to be a superior venue for getting to know this band of female soccer players through warmups, reminiscences, and teenage dramas that are way more interesting than your average television teen plot. 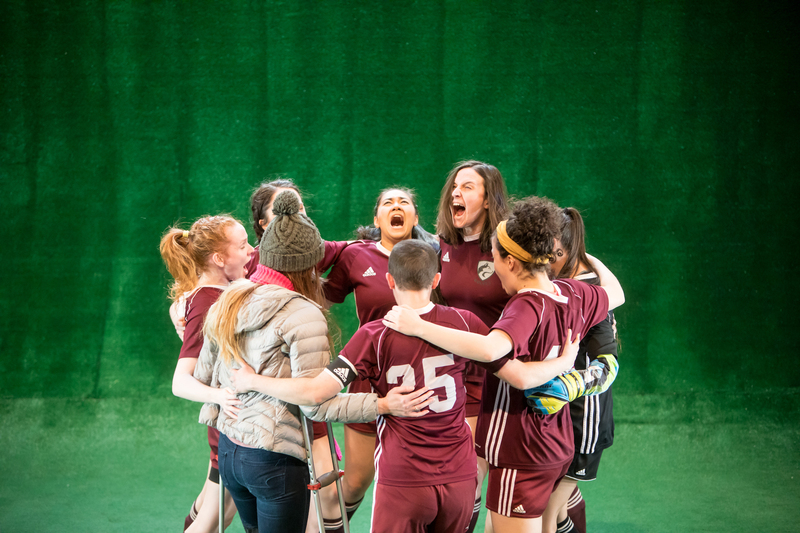 If you missed The Wolves last year and don’t want to read an older review, here’s what you need to know: it’s an all-female narrative populated with nine 16-17-something high school girl soccer players, plus a cameo-ing soccer mom. Except for props master John Novak, the creative team is all female-identified: director Sarah Rasmussen, costume and scenic designer Sarah Bahr, lighting designer Karin Olson, sound designer Katharine Horowitz, and stage manager Amanda K. Bowman. The cast of the Jungle Theater’s The Wolves gathers for a huddle. Photo by Dan Norman. Since the all-female cast feels noteworthy itself – and because this show turns on its strong ensemble performances, and because women are so commonly left out of the featured credits and review lines – it’s worth noting each of the actresses by name: Chloe Armao, Jennifer Blagen, Megan Burns, Meredith Casey, Becca Hart, McKenna Kelly-Eiding, Rosey Lowe, Shelby Rose Richardson, and Isabella Star LaBlanc, and McKenna Kelly-Eiding. The part of the silent maid is played by the 400 pounds of turf that cover the stage – much abused, and silently screaming, I’m sure, at all the indignities it’s expected to put up with. If you read Samuel French’s website, The Wolves is classified as a romantic comedy. This makes about as much a sense as an Alternative music chart in this day and age. Speak instead of how interesting these characters are, both in what they say and what they don’t, and in all the topics that flow from their mouths where you wish you could spend more time getting to know these ladies. DeLappe’s script was a Pulitzer Prize for Drama finalist and won the 2015 Relentless Award, and seeing this play makes it easy to see why. If we still had Iveys, I’d give one to Sarah Rasmussen for bringing it to the Twin Cities. The Wolves runs through February 17 at the Southern Theater in Minneapolis, MN.